Take a trip to the Serengeti and you'll see why Raging Rhino slot game from WMS is the most impressive beast in not only Africa, but the world. Gorillas, cheetahs, crocodiles and eagles might be impressive, but they all pale in comparison to the king of this grasslands, the rhino. 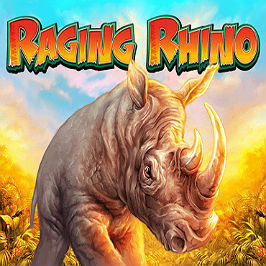 When you ante-up and take a turn on the Raging Rhino slot game, you'll not only be thrust into a world of animal calls and images, you'll have a mind-blowing 4,096 ways to win. Yes, that's right, you'll have more than 4,000 ways to pick up a prize when you spin any Raging Rhino slot just once. To find out a bit more about this game and why rhinos should become your new favourite animal, take a trip through our Raging Rhino slot guide! In terms of imagery, Raging Rhino won't blow you away. Yes, the interface is bright and colourful, but the lack of animation does show that this slot is slightly older than some of its peers. However, fear not, because the software provider WMS has made fantastic use of sound in this game. The various animal sounds you hear throughout the game make up for any lack of depth in the design of the game itself. Another interesting feature to note is that the Raging Rhino reels move as you spin. What we mean by this is that the interface moves to take up the whole screen as the reels spin and then moves back again once you're done. Although this doesn't change the actual flow of the game, it creates a unique dynamic that's slightly different to what you'll find with a slot game type of this nature. When it comes to setting your bets, the Raging Rhino online slot has an interesting dynamic. The first thing to note is that there are six reels and no fixed paylines, a break from most online slots that offer fixed paylines typically ranging from 10 to 50 ways to win. Secondly, you can increase the "level" of your bet depending on what you want to spend. Basically, the starting bet is always set at 0.40 credits. From this, you can then multiply it by 1, 2, 3 and so on until you reach the max bet of 150x. So, by the time you've clicked up to the max multiplier, you'll be wagering 60 credits per round. Naturally, the more you stake the more you stand to win. At the top stakes, you'll win anything from 15 credits (three 10 symbols) to 450 credits when you roll in six rhinos. At the lower end of the spectrum, three 10 symbols are worth 0.10 credits while the rhinos will get you 3 credits. But what about big wins? Well, for the top payouts in Raging Rhino you need to unlock one of its special features. However, because this game operates on an all-ways wins basis, you'll have plenty of opportunities to pick up plenty of incremental prizes. 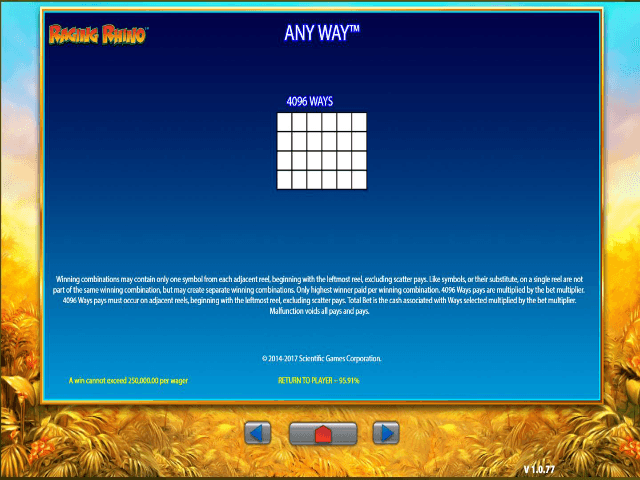 In fact, as we've said, this game's defining feature is the fact you'll have a staggering 4,096 ways to win! To send the raging rhino into a frenzy, you'll need to roll in three, four, five or six scatters (the diamond). Doing this will unlock a free spins round where you can turn the reels as many as 50 times without charge. On top of this, you can re-trigger the free spins at any time by rolling in more scatters. However, the reason this Raging Rhino slots bonus really stands out is because it also unlocks a giant jackpot. If you're able to find six scatters, you'll win a jackpot that ranges from 400 credits to 60,000 credits depending on the amount you bet. In short, if you're looking for more ways to win some serious slots prizes, you need to forget all other animals and take a turn with the Raging Rhino. Thanks to numerous partnerships with some of latest online slot sites to hit the web, Raging Rhino can be found all over the internet for players to enjoy! If you like Raging Rhino - You'll like these slots too!